StephenFranks.co.nz » Blog Archive » R.I.P.? 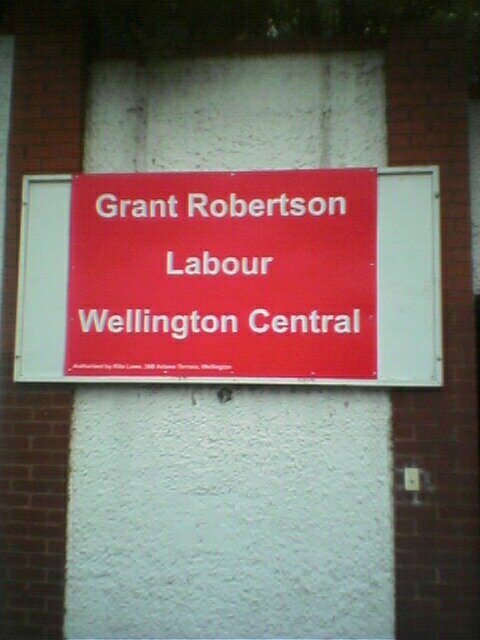 Sign on Glasgow Street wall. Under Wellington City Council rules, election signs on Council property may go up only after the official start to the campaign. On residential property, signs may only advertise a neighbourhood event. Whether on road reserve or private property, it seems to breach WCC rules. Another case of Labour breaking the law they insist everyone else obeys? Perhaps for an epitaph it’s OK. Under Wellington City Council rules, election signs on Council property may go up only after the official start to the campaign. The Electoral Finance Act (as the Electoral Act did before it) over-rides city bylaws in the two months before polling day – rules designed to create a single standard across the whole country. Perhaps that’s the explanation Graham. H Clark is planning a short notice election (4th or 11th October) and only favoured Labour candidates (out of her office) are in the know. Incidentally that provision has a gap. I negotiated its predecessor with Hon Rick Barker. In its draft form it was ineffective. He accepted some of my changes, but would not over-rule his officials to include an over-ride on sign location. Accordingly some local authorities have specified only a few permitted sites. Wellington City Council is reasonably generous, but one of my fellow candidates from a lsrge central North Island electorate tells me a District Council in her electorate has stipulated only 10 sites for a vast area. I assume you now regret this premature eulogy Stephen?